← My first cover story! One of the things I was looking forward to when visiting Paris though was not the over-hyped Mona Lisa but the works of Vincent van Gogh in the Musee D’Orsay in Paris, one of the largest museums of modern art in the world. Van Gogh was a Dutch post-impressionist painter. His work is nearly always depicting a rough beauty and bold colours and if I’m not losing anyone, its emotional honesty. His works inspired the artists of the 20thC and beyond but he was never able to enjoy any success. He suffered from anxiety , depression and mental disorders and died at the young age of 37 apparently by a suicide gun-shot although no gun was ever found. Vincent started drawing as a child and over his short life painted thousands of works of art. 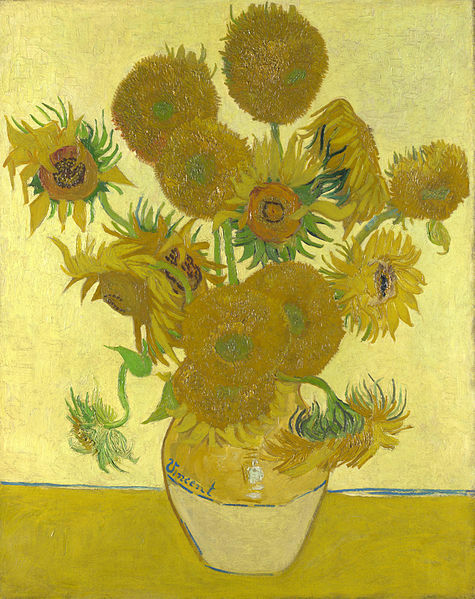 Especially famous are his self-portraits, landscapes and of course those Sunflowers. He split his time between London, Paris and The Hague and had ambitions to become a priest. Later he moved to southern France and the sunshine and bright colours began to influence his work along with coming into contact French Impressionist painters when he moved to Paris in 1886. Much has been made of Vincent Van Gogh’s tragic illness which left him unable to paint for long periods of time and when he died he was in his prime as an artist. It is possible that his mental illness helped him produce his increasingly spectacular works of art which when exhibited in Paris were described by Monet as being the finest works of art in the exhibition. Vincent began to seek medical help for his illness and when he switched clinics to see Dr. Paul Gachet in Auvers-Sur-Oise his first impression of the doctor was that he is “sicker than I am, I think, or shall we say just as much”. His work during this period was prolific with 70 paintings in as many days. His relapses became worse and he suffered a month long relapse ion July 1889 and an even worse one in December 1889. More than a hint of his state of mind can be seen in the desperate figure in his painting ‘At Eternity’s Gate’. He was plagued by nightmares and bored out of his mind having to paint from inside an asylum. Despite the troubled clouds that feature in many of his paintings, van Gogh loved the countryside and the corn fields that he lived amongst. On the day of 27th July 1890, van Gogh left the inn that he was staying at after breakfast. It was his habit to stay in sparsely furnished rooms and attics and spend all day outside. Unusually for him, he didn’t return until about 9pm and when he did so he was clutching his stomach. Vincent told the inn keeper that he had shot himself in his stomach and fallen unconscious but the cool air of the evening revived him. Though he tried to find the pistol to finish the job he couldn’t find it and so had returned to his room where the inn keeper had found him curled up on the floor. In recent years studies have been made into Van Goghs death which have raised doubts over when he did indeed commit suicide. The gun wound was apparently not at an angle consistent with suicide and instead it is theorised that Van Gogh was the victim of accidental death by three boys who had too much to drink. This would also explain Vincents declaration to the Police that it was he and not others who fired the fatal bullet. For me somehow knowing his tragic story makes me appreciate his paintings even more. 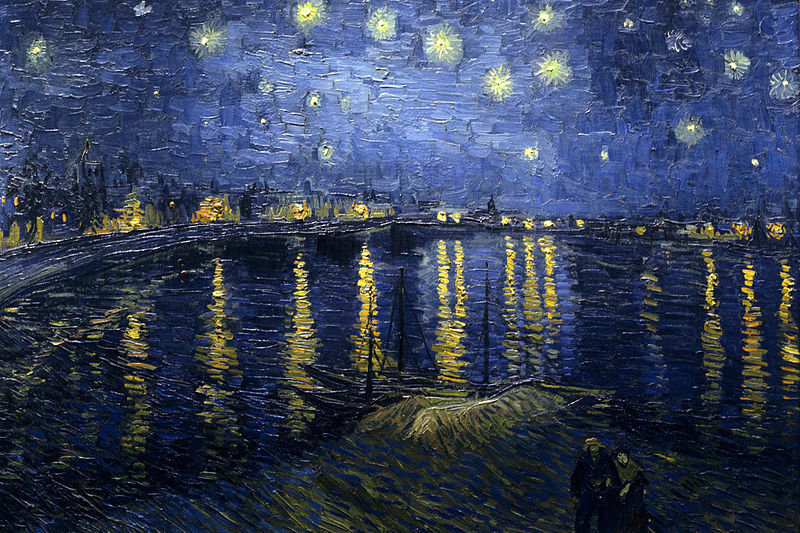 There aren’t any that I know that I don’t like although my favourite has to be Starry Night Over the Rhone. I love the vibrancy of the stars in the night sky. If you want a recent dramatic and touching look at Vincent van Gogh you might want to check the ‘Vincent and The Doctor’ which is a slightly unexpected but truly magical episode of Dr. Who which goes a long way to demonstrating the tortures that Vincent went through and in this case makes one of the demons that haunts van Gogh’s mind as an actual scary though harmless monster. It’s one of the most emotional ways to spend 45 minutes. I wish Vincent van Gogh were still alive so I could tell him how much I love his work. Van Gogh wrote that he didn’t have any children and that his art would be his progeny as indeed were the countless artists that he inspired. His work can be found on permanent exhibitions in London, New York, Paris, Amsterdam and other large galleries. Do you have a favourite painter or sculptor? I know one or two follow my blog and one of my favourite is Karen Gadient who can both paint and write. A lot of her work is bold, bright and to me quite interesting which I really like plus she likes Dr Who so I hope she liked the Vincent episode too. I can write and am musical but sadly my painting and drawing hasn’t ever progressed beyond the levels of a 5 year old. Maybe I could pretend my paintings are done by one of those artistic chimpanzees on a bad day. This entry was posted in Culture, history, Life and tagged Art, Culture, Dr Who, history, Life, Mental Illness, Painting, Suicide, Vincent van Gogh. Bookmark the permalink. I didn’t know that Doctor Who ventured near Van Gogh. It strikes me an an excellent way of introducing a broader audience to the man and the tragedy that befell him. His story reminds us of the fact that we could be undervaluing talent today- within and beyond the world of art- that future generations would treasure as much as Van Gogh’s spectacular art. Yes it was a great way, I certainly know one or two people who got into van Gogh and art generally through that one episode. You’re right of course, the current climate in many nations only value people who make a lot of hard cash no matter how. If you have the talents of van Gogh or Beethoven it is likely you would be thrown on the scrap heap as much of society doesn’t value anything other than money whether it is artists, musicians, social and care workers of even scientists and engineers. I wonder how many brilliant but in some ways unwell or eccentric minds are lost for their unconventional ways of being. Very worrying- I’m sure it’s inevitable to some extent, but there’s a lot to be gained from bearing it in mind. I’m not sure that I have a favorite artist, although van Gogh would be near the top. We’re also fortunate to have world class museums nearby in Philadelphia. I’m with you in that I can write and have some musical ability, but I cannot draw at all. My mother though, who can not see very well at almost 92 years old, still paints. That is amazing about your mother. Good for her at pursuing her hobby at such a good age. A very enjoyable and informative commentary on Van Gogh. Thanks Rosemarie. There is so much to tell about this great artist and very complicated person. 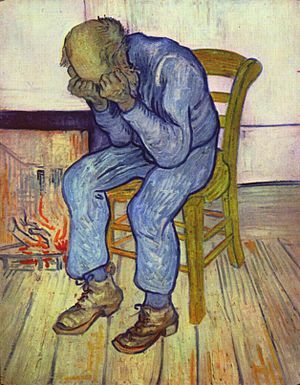 One of the most haunting songs from the 1970’s that I remember was Don McLean’s “Vincent.” Van Gogh is a tragic figure…. thanks for posting. I just went to look this song up and realised I know it well from my childhood but had no idea it related to Vincent. Thank-you for that, it is a very haunting song. Thanks Stephen. Van Gogh is my favourite painter. He generally used a trowel rather than a brush which means his pictures are almost three dimensional. You mention crows: the more unsettled his mind then the more crows he tended to paint. Regarding Dr Who – an excellent episode: Tony Curran portrayed Van Gogh excellently. He also looks uncannily like him as well. Oh I didn’t know about his painting techniques, that explains the “rough” textures of his paintings. I think it is my favourite “new” Dr. Who along with ‘Blink’. Tony Curran looks very similar, they did well to cast him. That episode could very easily be just a drama with out the Dr.Who element but the way they brought him to the modern day was the icing on the cake. It is a thoughtful expression isn’t it? That must be why I like it too. Thoughtful but not pompous. I was going to mention the Doctor Who episode, a very powerful piece of television. The ending is superb. A very talented man whose great work I hope will live on for eternity. Yes the ending was amazing, how they brought him to the future to see his fame and how much he is appreciated and then took him back but with the same tragic consequences. Thanks for commenting! Van Gogh touched me too, when I was developing into a young adult. He does communicate his feelings through his art, as does L.S.Lowry , who I think had view of the world affected by being a the autistic spectrum, but that is only speculation from me. I wrote a blog about seeing an exhibition of his. I can’t say I have favourites any more, as my appreciation grows as I get older of so many men and women who have used art as a means of expressing what it is to be human.Thank you fro a wonderful post. I’m so jealous you got to see this in Paris. I teach art lessons in my kids’ classes as a volunteer and Van Gogh was one of our artists. I’m not much of an artist either, but I really enjoy it and love learning about all the different artists. Great post! Apologies for such a late comment, especially when you mentioned me! I was out of town for the last few days. The very first thing that popped into my head when I saw this post was Doctor Who (so you know me well–and thank you for the mention). I have such admiration for Van Gogh’s work. Brilliant soul. Excellent post. What an interesting post – I so enjoyed it! Thanks! Thank-you! My low sugar diet is still going strong btw! A pleasure! Did you make your own fresh orange juice? Hope so and hope you enjoyed it – so worth the effort I believe! Thank you for writing on Van Gogh and mentioning the Dr. Who episode! Oddly enough, I literally just finished that episode. I am a new Dr. Who fan, with my friends recommending I start with Matt Smith. I’m hooked! This episode meant so much to me as I too suffer from mental illness, Bipolar Type I. 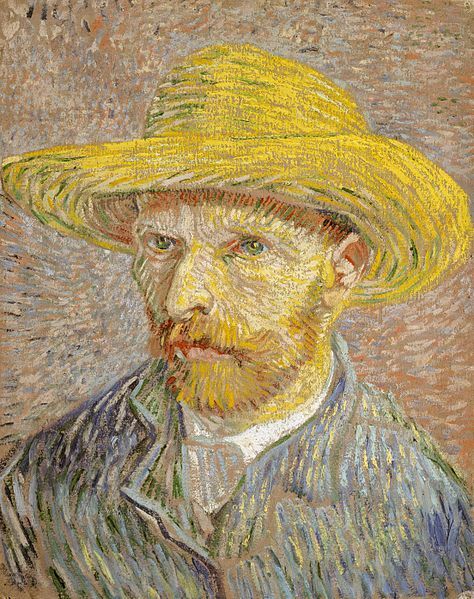 It is believed Van Gogh was Bipolar. After the episode I searched “tragedy of Van Gogh” and your article was one of the first links. I was pleasantly surprised when I got to your recommendation to watch the Dr. Who episode I had JUST finished! You are right, it truly was emotional and well done. Thanks so much for your comment Amy. You are in for a treat with Dr Who then. (New series starts today in the UK). Vincent and the Doctor is wonderful on so many levels and shows the magic of sci-fi when done right, can be better than any other genre. I am torn between wanting to go back and watch it right this minute but being aware of how beautifully upsetting it can be. I’m glad you like my post though and hope like me, you’ve gained a new insight and appreciation to the tragic genius of Vincent Van Gogh.